Svord Peasant Knife Green handles. 6 3/4" closed. Extended bland tang allows for one hand opening. Hang it from your belt or whisk from your pocket by its handy tang. Colored polypropylene handles. It's easy to use, easy to carry and to open. The Peasant Knife is based on models used in Bohemia and Bavaria 300-400 years ago. Hang packaged. 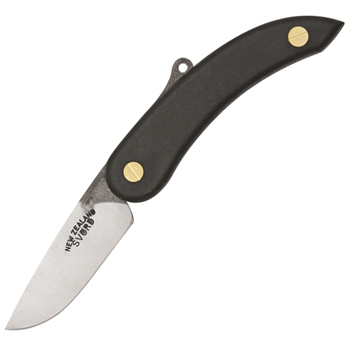 Knives feature Swedish high carbon tool steel blades. Blades are individually hardened and tempered using a unique heat treatment process. Blade is hand ground with a water cooled stone to produce a convex razor edge. Designed and produced by Bryan Baker.